Ref Abuse; Should you watch what you say to the ref? I found it astonishing whilst refereeing and now coaching referees that I see players,parents and club officials say things to match officials and I think “I wonder if that was in a pub if he would say that?” I remember one incident recently where the referee, who was a very good amateur boxing champion, was receiving an awful lot of abuse from a manager. The manager was a little fellow and very slight but boy did he have some lungs on him. The referee was about 5 foot 10 (1.8m) thick set, had tattoos and he had muscles in his finger nails. The manager called him every name under the sun and then the lino said to the manager “Oi! Watch what you say to the ref, he’s a boxer you know” to which the manager replied “I don’t care if he’s a Rottweiler, he’s having a terrible game”. It was a very funny reply and I still smile when I think about it today but after that comment by the lino, reality slowly set in with the manager and you could see he was pondering his options and was very quiet after that… makes you think doesn’t it? There is a common perception that referees are boring people with no personalities and the same amount of friends. I am also sure that there are some colleagues that would never talk to each other if they did not have to officiate a game together which, when you consider you have to turn up on match day and work as a team,could cause the referee problems as well as letting down the two teams on the day. The point is, whether we like each other or not, on match day we must be the ultimate professional and put our personal feelings to one side and work as a team to offer the best experience we can to the teams we are officiating. This is the case not only as a team of three but when we are one our own handling parents. This brings me onto one of the problems referees have in regards to perception. We are perceived by many as “the necessary evil of football”. But boy do they miss us when they don’t have an appointed referee, the manager or the substitute or someone has to referee the game and that person can no longer be seen to support their team. The referee community is made up of all sorts of people from all sorts of backgrounds, for example, I know active referees’ who are ‘Bouncers’ at nightclubs, MMA fighters, ex-military decorated heroes and some very tough former players. It always amazes me that these sort of Refs don’t seem to get much stick when the players know their background but often the 6 stone wet 15 year old does. Brave individuals aren’t they? On and personal note I did a game and was constantly barracked by players, parents and mangers alike, I really did not know how to deal with it and I tried to calm players down with my sharpe wit. This didn’t work and I had to resort to cards and sent two players of for some very choice words and actions towards me. After the game I was threatened and it all got a little heated in the dimly lit car park. Fast forward three weeks and an article appears in the local newspaper (see above) about me recovering my Van from two thieves who had stole it weeks earlier. 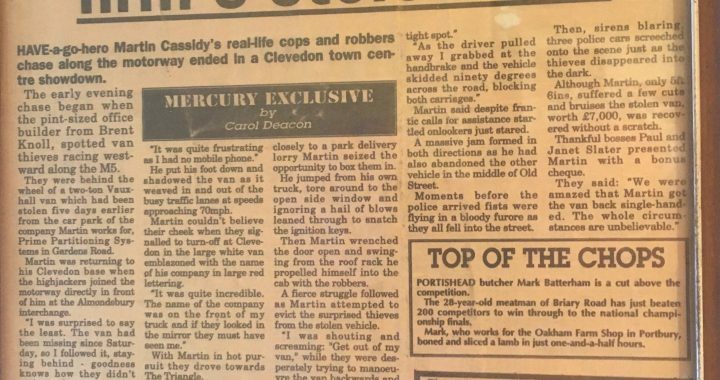 The van , the article says, was recovered after a “Bloody Furore” after “Fists flying everywhere” said a witness. The game the next Saturday was involving the same team I had all the trouble with. In the same car park before the game the manager, who had given me lots of stick weeks earlier said, was that you Ref in the paper about fighting with two car thieves. “yes it was” I said “Oh right” This may surprise you but the game went ahead with no challenges to my decision and they bought me a pint after the game. Interesting that isn’t it? There has been much research undertaken on a subject called ‘social proof’ an example of which is: you are walking down a street and you see a group of people who are looking up to the sky. It’s guaranteed that you will automatically look up to the sky to see what they are looking at, this is social proof, we don’t know what we are looking for or at but we will follow the actions of others. Another example of ‘Social Proof’ if you are leaving a church and there’s a plate for collecting money, everyone in front of you will put some lose change on the plate, you will automatically feel you have to put some change on the plate too, that’s social proof at work again. Social proof is what I believe happens with players, parents and managers. If a manager/parent starts berating you then one of his player‘s will follow, more will join in and this will contaminate the game and effect your match control. The point is this. Players, parents and managers will always give us stick, it is part of the game and maybe a “thicker” skin is required at times but players and managers alike really need to look at themselves and think “would I say and act like this if he didn’t have a referees kit on…” the answer is probably “No”… Social Proof. Posted in Blog and tagged lovethewhistle, social proof.